The Discovery astronauts worked through a busy half day in space Thursday, enjoyed a meal with their space station colleagues and took the afternoon off, looking forward to a call from President Barack Obama later in the day. NASA managers, meanwhile, decided to extend Discovery's mission a second day to give the crew more time to help unload a newly attached storage module. "We've just gotten official word that the MMT (Mission Management Team) has decided to go ahead and add the extra extra day so you'll have one more day on orbit," astronaut Megan McArthur radioed from Houston. "All right, I'll pass that word along," replied Discovery commander Steven Lindsey. "That's great news. We're excited." Discovery's 39th and final mission originally was scheduled to end March 7, but NASA managers decided Monday to extend the flight by one day to give the combined crews more time to unload the newly attached Permanent Multipurpose Module. The PMM, the International Space Station's final U.S. pressurized module, was launched aboard Discovery loaded with supplies and equipment, including a humanoid robot known as Robonaut 2. Along with unpacking the new supplies and equipment, the astronauts also are moving packing material and no-longer-needed hardware from the PMM to a Japanese cargo ship that is scheduled to be jettisoned March 28. 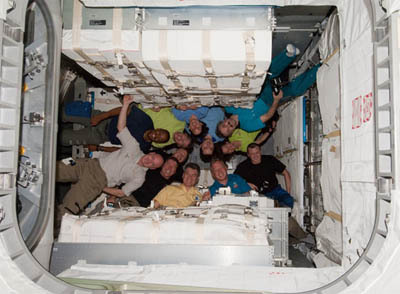 With Discovery in good shape, NASA managers decided Thursday to add a second docked day to the shuttle crew's timeline. Under the revised flight plan, Discovery will undock from the space station at 7:03 a.m. Monday, March 7. After a final heat shield inspection and routine pre-entry tests of the shuttle's flight systems, Lindsey and pilot Eric Boe plan to guide the veteran spaceplane to its final landing at the Kennedy Space Center at 11:58 a.m. on March 9. "We're seeing a program come to a close here and to see these shuttles, these beautiful, magnificent flying machines, end their service life is obviously a little bit sad for us," astronaut Michael Barratt told an interviewer earlier Thursday. "But it is about time, they've lived a very long time, they've had a fabulous success record, they've built this magnificent space station, they've given us lots of science and a tremendous amount of experience of just how to operate in space. "More than anything, we look forward to seeing them retire with dignity and bringing on the next line of spaceships." NASA released spectacular footage Thursday that was captured by cameras mounted on the shuttle's twin solid-fuel boosters showing Discovery's final climb to space Feb. 24. The cameras, looking down, up and sideways at the shuttle's external tank, showed a normal ascent with no obvious signs of foam loss or damage to the ship's heat shield. NASA managers cleared the heat shield for re-entry earlier this week, after completing a detailed review of ground-, shuttle- and space station-based photography of Discovery's protective tiles, nose cap and wing leading edge panels. For Discovery's crew, Thursday provided a welcome half day off to relax after a busy week in orbit. The astronauts were awakened just after 5 a.m. by a recording of U2's "City of Blinding Lights" beamed up from mission control. "Good morning, Discovery," astronaut Michael Massimino called from Houston. "That comes to you from your crewmate on the Earth, Tim Kopra. That was going to be Tim's wakeup song and he asked us to play that for you today to honor his crewmates in space." Kopra, the Discovery mission's original lead spacewalker, was injured in a bicycle accident in Houston in January and was replaced by astronaut Stephen Bowen. "Thanks to Tim for that," replied Lindsey. "Even though he's on the ground, he did a wonderful job supporting us during the EVAs and as he knows, he's still with us right now." The shuttle astronauts spent their morning moving cargo to and from the International Space Station while Expedition 26 commander Scott Kelly and flight engineer Catherine Coleman serviced one of the lab's two U.S. carbon dioxide removal units.